The Baby Bear is based on the book Muscular Portfolios (BenBella Books, 2018). The strategy is a clone of a whitepaper first published in 1996 and repeated in numerous presentations since then by Jack Bogle, founder of the Vanguard Group. The Baby Bear is designed to achieve performance similar to the S&P 500 over each complete bear-bull market cycle with smaller drawdowns than the index. 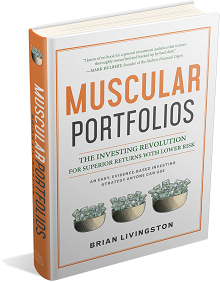 The strategy is not a Muscular Portfolio but a starter portfolio. It’s primarily designed to keep trading costs exceptionally low for people who have less than $10,000 to invest. The investing menu consists of low-cost exchange-traded funds (ETFs) that track two asset classes. You allocate roughly equal dollar amounts to each ETF. The table below is updated every 10 minutes during market hours, but you trade the Baby Bear no more than once a year. The portfolio should be rebalanced back to 50/50 in December or January, if either ETF is more than 5% off its target dollar weight. Strategy Rules: The Baby Bear Portfolio, unlike a Muscular Portfolio, has no strategy rules. You simply allocate 50% to each of the two ETFs shown above, regardless of market conditions. Execution Rule: Buy or sell an ETF only if its bid-ask spread is less than 1.0%. (If greater than 1.0%, a “flash crash” might be occurring. Check an hour later to see whether an orderly market has been restored.) Popular ETFs typically have spreads below 0.2%, but some bond and commodity ETFs have legitimately higher spreads due to trading differences. 5-mo. return is equal to an ETF’s nominal total return (not inflation-adjusted but including dividends) over the past 105 trading days. Prices and returns, at least 20 minutes delayed, are recalculated approximately every 10 minutes while the market is open. To refresh your browser window, press F5 or Command+R. Bid-ask spread is the difference between the bid price and ask price of a security, typically expressed as a percentage. A flash crash is a temporary situation lasting a few minutes, during which prices and spreads suddenly move far from their typical values.